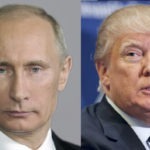 Earlier this week Vladimir Putin concluded that he and his puppet Donald Trump had overextended themselves. Putin announced that he didn’t think he would accept Trump’s offer to visit the White House. Sure enough, Trump took the hint, and “postponed” the planned visit until next year. It was clear that Putin wanted to avoid standing next to Trump for quite awhile, in the hope that accusations of treason against Trump would blow over. Then everything blew up yesterday, and now Putin is hitting the panic button. Last night we learned that Michael Cohen witnessed Donald Trump signing off on Donald Trump Jr’s meeting with the Russians during the elections, and that Cohen is willing to testify about it. This changes everything, because it looked like there would never be a witness willing to confirm that Trump knew about the meeting. Now that there is, we can draw a fairly straight line from Donald Trump to an eventual prison cell. This has prompted Putin to abruptly change course. Just days after having decided that having another meeting with Trump wasn’t worth the bad optics, Putin has changed his mind and invited Trump to come to Russia. Naturally, Trump has responded by saying that he’s open to visiting Moscow, because his puppet master has spoken. But the story here is Putin. He’s still well aware that his asset Trump is going to be severely damaged by holding another meeting so soon. But Putin clearly sees this latest development as such a problem in need of discussing, he now wants to hold the meeting anyway. Some folks out there are insisting that this latest move is all part of Vladimir Putin’s master plan. No, not a chance. By abruptly reversing course, Putin is making himself look foolish, and he knows it. This isn’t part of some plan. This is Putin hitting the panic button, because the Trump-Russia scandal just took such an unexpected ugly turn, he feels that he no longer has a choice.